Still behind with these updates! I’m actually 35 weeks right now, and only just finding the time to post my 32 week update! My energy levels were still not back to normal this week. Seems last week’s stomach bug really took it out of me. And people seem to have noticed the effects as well. 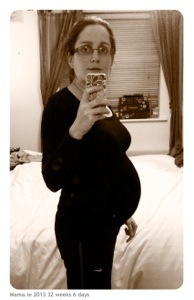 Lots of comments coming my way about how neat my bump is. At my doctor’s appointment at the beginning of this week, the GP was a bit concerned to note that my weight hasn’t changed since my last visit with him four weeks beforehand. But considering that I’d estimate I lost 4-6lbs while I was sick, the news wasn’t much of a surprise to me. By the end of the week, my energy levels were rising again and I was feeling a lot better. Plus I was happy that I started regaining the lost weight. The photo below was taken as I got ready for my pregnancy yoga class, and I think it’s fairly obvious the bump is growing again! Speaking of yoga, if you haven’t tried it during pregnancy I highly recommend it. I think a lot of people try it out in early pregnancy, find it too easy and quit. But really it’s in the final trimester that you notice the benefits from it. The various poses and stretches adapted for pregnancy help to work out those aches and pains and the general discomfort that accompanies the last few weeks. I know that the breathing techniques I learned in yoga last time around came in very handy during labour. That and the relaxation techniques that we practised.